We would like to describe the weather in Paonia, but some of us don’t really know what it’s like, now that much of our editorial department has moved to our experimental satellite office in Gunnison, Colorado. One thing’s true in both places, and throughout much of the West: It is warm out there. In Paonia, we’ve welcomed Luna Anna Archey as our new associate photo editor. Luna, who is from Eaton Rapids, Michigan, came to the Western Slope in June, having flown to the U.S. from Uttarakhand, India, where she worked at a non-governmental organization. Luna discovered photography as a possible career path at the University of Michigan, where, as a member of the crew team, she had to choose between photography and rowing. We’re selfishly glad she ditched oar for camera, serving as a senior photo editor for The Statement magazine, part of the university’s newspaper. “It’s so good working with people who are unimaginably passionate and talented at what they do,” she said. We agree! 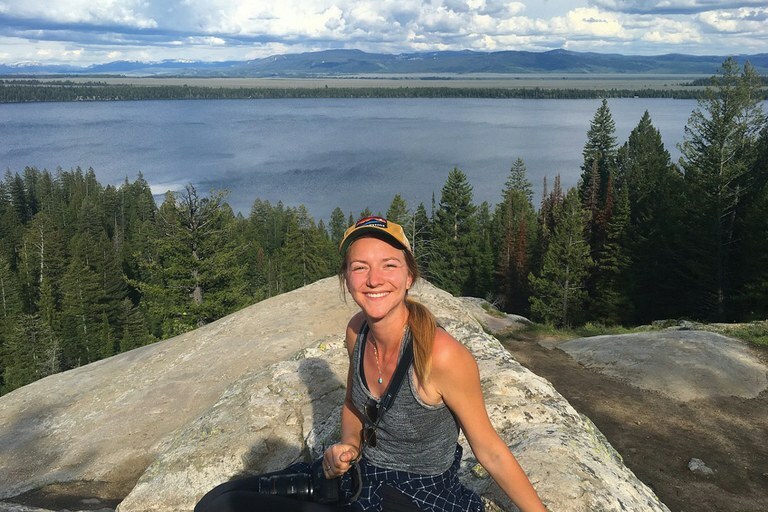 Luna Anna Archey, our new associate photo editor, hoping to spot moose at Grand Teton National Park. Meanwhile, this summer, our editor-in-chief, Brian Calvert, graduated with an M.F.A. in creative writing from Western State Colorado University. For his final project, Brian wrote a wildfire-themed, one-act opera libretto. We’re proud of him — but happy to have our editor back. In staff changes: Kate Schimel, who expertly filled the role of deputy editor-digital for almost two years, has transitioned to being an associate editor. She’ll be moving soon to Seattle, to head up our coverage of the Northwestern states, while Gretchen King, our former engagement director, takes over as the new digital editor. Other staff members spread across the country this summer. Associate Editor Tay Wiles and Executive Director Paul Larmer participated in the Rural Sociological Society’s annual meeting in Portland, Oregon. Associate Editor Maya L. Kapoor wrapped up a fellowship at Vermont Law School, where she took a food and agriculture policy class and gave a talk on rare species protections. Janet and Bill Hunt, two Deadheads from June Lake, California, drove through Paonia on their way to Kearney, Nebraska. They had dinner with Executive Director Paul Larmer, Director of Development Laurie Milford and Assistant Editor Emily Benson. The dinner was in part to thank the Hunts for their donation to our American West(s) documentary series, scheduled to come out later this year. We also welcomed a group of instructors and students from Texas Tech University in Lubbock, Texas, who were in town to attend a workshop at Elsewhere Studios. Carol Flueckiger, who will be back in Paonia to lead a solar-powered painting symposium, led the trip. We’d love to see you come visit us, too. We’re arranging new tour hours for our Paonia office: Monday through Friday, 1:30-3:30 p.m. daily. But you’re welcome any time if you call ahead (1-800-905-1155). See you here!